Four options for Clean Air Zones (CAZ) in Bristol have been identified. Council leaders are set to approve the next step towards charging vehicles coming into the city. Cabinet members will vote next week to examine the options, with a final decision set to be made next year. Officials said CAZs will bring a "substantial and quantifiable public health benefit". 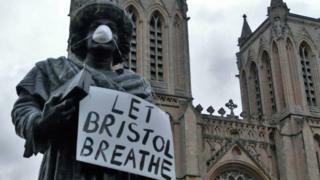 Some 300 people a year are thought to die in Bristol in each year as a result of air pollution. Bristol has long suffered from poor air quality, particularly from high levels of nitrogen dioxide (NO2), with an Air Quality Management Area (AQMA) declared in 2001. This identified a large area of urban Bristol with about 100,000 residents where NO2 levels breached UK and European legal standards. Of the four options for a CAZ which will be identified in more detail, the one with the largest impact would see all vehicles charged for entering the AQMA. Other options include a zone covering the AQMA which charges all vehicles except cars, plus two similar options which cover a smaller area in the city centre. The council said: "Looking at the overall general trend of nitrogen dioxide pollution in the city we can see no significant improvement in pollution levels, which remain above the legal limit values." Green Party councillor Jerome Thomas said the figures - which showed 40% of NO2 pollution in Bristol came from diesel cars - "suggests any plan to secure breathable air for Bristolians must include action on these polluting vehicles". In November, councillors unanimously called on the mayor to develop a Clean Air Action Plan and to implement a Clean Air Zone. Bristol and South Gloucestershire Councils have already secured £498,000 of government funding to undertake a feasibility study into a CAZ. Bristol mayor Marvin Rees said: "Air pollution is a serious problem in Bristol and it is unacceptable that lives are at risk because of harmful traffic emissions."